When you look at reading programs for special education classrooms, especially those for students with significant disabilities, two programs immediately pop up. So please join me as we take a quick look at both of these programs. One program is Edmark Reading Program. It has been around since 1972 and is well liked by many special education teachers. Another program that comes to mind is PCI Reading Program. This program is fairly new starting around 2009 . Both of these of these programs are excellent materials to use when teaching reading to students with disabilities. Both have significant strengths and only a few differences. As a Special Education teacher of students with significant disabilities for the last 12 years, I have used both of these program extensively and have seen both of them work their "magic" in teaching students with disabilities how to read. I say "magic" because it almost seems like that sometimes. It NEVER gets old watching a child's eyes light up when they realize they CAN READ a word for the first time. Its a lot of hard work, of course on the student and the teacher's part, but there is THAT moment when, that" light bulb" goes on and you can almost see it turn on within the child. They are proud of themselves and they WANT to learn more. A lot of times when you speak with teachers, you find they have great allegiance to one or the other of these programs. Sometime teachers have a choice as to what program to use but other teachers must use what is provided to them by their school or district. I am different. I adore both, have used both extensively and feel both have their place in our world of working with students with disabilities. I used Edmark extensively for many years until PCI Reading was introduced in our county and we were instructed to use PCI as our primary materials as it followed our standards closely and use Edmark as a backup, supplemental program. Before we start, lets start with a couple of similarities between the two programs. Both are designed for use and work well with students with developmental disabilities and autism as well as students with significant learning disabilities. They both have extensive research to back their use. They both use an errorless approach to teaching the materials to students. This means student have a high rate of success and can see themselves as successful readers. Built into both of them is a spiraling repetitive teaching sequence of the content that helps ensure students a successful learning experience. They both focus on giving students a solid foundation of common base vocabulary upon which students can build their reading skills. 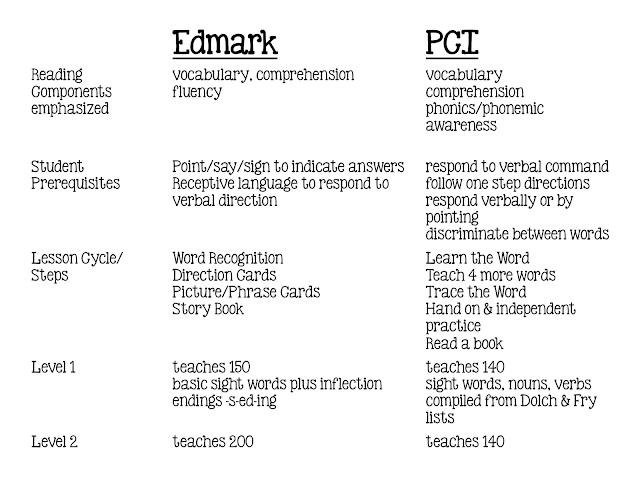 Both PCI and Edmark teach a highly structured set of words with sequential teaching steps broken into small increments to increase the learners' success. Here is a quick look at a few factors of both programs. Let's look at each one separately for a moment. When a student successfully completes Level 1, they have usually progressed from nonreader to being able to read approximately 1.0 GE materials. The words taught in the Edmark program include words that can invoke an image. Words such as ball, car, airplane, him, you, milk, and zoo. The approach used in Edmark is basically a sight word approach is an alternative to learning to read with phonics. Edmark has a software component that once taught, can often be used independently by students. Edmark also has a manageable systematic record keeping with lesson by lesson and word by word tracking that provides way to record reteaching. Sight words used in the program are primarily for grades K-3 but that doesn't mean the student will be reading on grade level 3 when they have successfully learned the words. Four instructional formats are used throughout the program: Word Recognition, Direction Cards, Picture/Phrase Cards, and a Story Book. Level 1 teaches the student 150 basic sight words plus endings (-s, -ed, -ing). Level 2 extends the learning by teaching an additional 200 words, plus compound words. Basic literal comprehension skills are taught through pictures, and directions cards. Edmark's comprehension is very basic literal comprehension skills and very useful for beginning readers. Here is an example of a Level 2 comprehension lesson in Edmark. The PCI Reading Program works on a 5 word cycle then assess. This program includes errorless discrimination, positive reinforcement, a controlled vocabulary with tactile reinforcement. It also has a great software component. It systematic record keeping is very concise, easy to track, quick to complete and tracks reteaching extremely well. PCI teaches 140 words in level 1 and the students can read a book after just 5 words are mastered. The words taught in PCI come from the Dolch and Fry lists and include more words that cannot be tied to an image in isolation, such as is, as, do, to or as well as more common words that can be connected to an image making it easier to remember. PCI includes phonics and phonemic awareness in the teaching of their materials. One of the places these two programs differ is in the treatment of comprehension, phonics and phonemic awareness. Level 3 in PCI takes the words learned in levels 1 and 2 and expands that learning into word analysis, and decoding while still expanding the students vocabulary and controlling the words in what is read. Level 3 also introduces students to new genres of nonfiction, and poetry while integrating writing, fluency and comprehension. Here is a video showing you some of the components in the PCI Reading program.While this video came out in 2009 when Level 1 was brand new, they now have levels 2 and 3 out. Thank you for stopping by. Its always great to hear from people! I have used both and have both in my classroom. I was able to return to using edmark this yr. The pci materials are nice and well presented but my students struggled with getting past the beginning words and were staying in review mode. I have used both programs and I really like PCI reading. I had to review quite often but I was able to use the computerized program(same as the books) as that reinforcement for each word. It really helped with those that were having difficulty and provide another way for my students with ASD to learn. I currently have Edmark and love it. I have a couple of questions...It sounds like you love both programs. 1.Are there times when you would use one over the other for specific students? 2.Have you ever tried to implement Edmark in a small group, rather than one on one? If yes, how did it go and what did it look like?